My mentor in cooking is Ina Garten. I just love her style and recipes so I do enjoy her cook books. The other cook book I use continually is one that was recommended to me by one of my favorite B&B guests, Ruth. She led me on to the How to Cook Everything –Simple Recipes for Great Food by Mark Bittman. I like it a lot because he kept true to his word: the recipes are simple with a lot of room for variations and YOUR imagination. The following recipe he delegated to short ribs, however, I had just bought some excellently priced boneless pork country style ribs and thought that they would do instead. And indeed, they substituted just fine and were excellent. So, I’m passing this on for your culinary enjoyment as well. Heat oil over medium-high heat in a Dutch oven or similar pot. Lower the heat under the Dutch oven to medium and cook the onion, stirring, until they begin to soften –about 5 minutes. Add all the remaining ingredients except for the carrots (celery) and salt if you wish to use that. Bring to a boil and return the ribs to the pot. Reduce the heat to low and cover. Cook gently, turning the ribs occasionally, for about 1 hour. I cooked my ribs for 1 ½ hours. 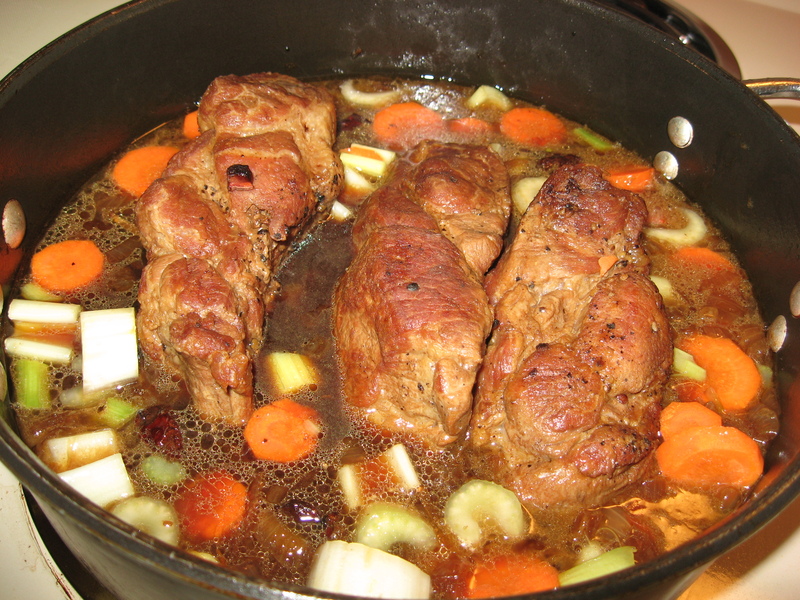 Then add carrots (celery) and cook for another 30-45 minutes or until the meat if just about falling off the bone. Preheat oven to 200 about 10 minutes before the ribs with the carrots are done. When your ribs are cooked in the pot just the way you want them, remove them and the veggies with a slotted spoon to an oven proof dish. Also discard the ginger pieces and the star anise. Place the pot in the 200 degree oven to keep ingredients warm. Turn the heat under the pot with the remaining sauce to high in order to reduce the liquid, stirring, until it is thick and syrupy, about 10 minutes. Taste and add salt or more soy sauce if necessary and spoon the sauce over the ribs. Serve with white rice and a side of salad or other kind of veggie.